My friend and sometimes colleague in matters aerospace, Dr. Jerry Pournelle, passed away quietly in his sleep this past Friday, age 84. Aerospace engineer, author of The Strategy of Technology and dozens of science fiction novels, raconteur, and Chairman of the Citizen’s Advisory Council on National Space Policy from 1980-1994, he was an intellectual of many talents and real humanity. Those of us who seek to open the space frontier to all humanity owe Jerry a debt of gratitude for life well lived promoting all things space and particularly for his decade-long effort to solve the problem of low-cost access to space. He well understood and oft repeated Bob Heinlein’s famous dictum: “Once you are in low earth orbit, you’re halfway to anywhere.” It took years, but Jerry managed to cajole a cantankerous Council of headstrong individualists into supporting what became the DC-X program, and then took that mandate into the office of the Vice President of the United States, with two other now deceased cold warriors, Max Hunter and General Danny Graham. The result of that meeting opened the door on a new space age. I’m particularly proud of the part I played in helping his Citizen’s Advisory Council reach the decision that reusable spaceships should be a national goal, but I hope Jerry gets more recognition of the role he played in death than he did in life. The current explosion of commercial space ventures owes much to his pioneering efforts, for example. It’s both ironic and profound that his last written words, on his Chaos Manor blog, were “Bye for now.” Goodbye forever, old friend, and thanks for helping us take a first faltering step on the road to the stars. The public memorial service for Jerry Pournelle will be held at noon Saturday September 16 at St. Francis De Sales Church located at 13370 Valleyheart Dr, Sherman Oaks, CA 91423. Please spread the word to those that would like to attend. We will try to livestream the service for those that can’t attend. Many thanks for all your well wishes. My family is very touched by your thoughts and prayers. 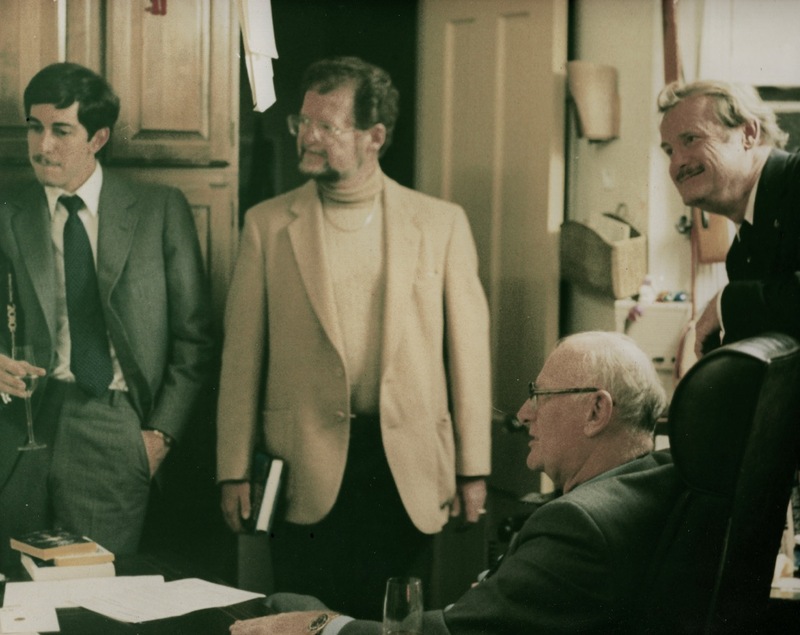 Left to right, Gary C Hudson, Larry Niven, Jerry Pournelle (standing) Seated: Arthur C. Clarke. At the 1983 Citizen’s Council meeting. Credit: J. Ransom. 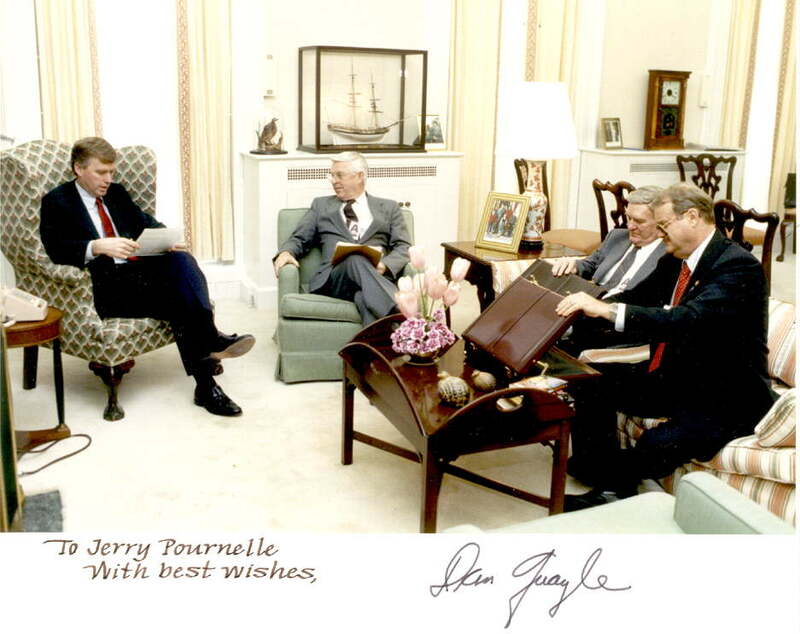 Briefing Vice President Dan Quayle, 1989, with the late General Daniel Graham and the late Maxwell Hunter II. Previous PostThe 2081 and High Frontier Free Giveaway is now over!Next PostNext Week: NIAC!